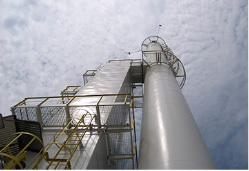 The POPLAR air separation plant produces liquid oxygen, liquid nitrogen, and, as an option, liquid argon suitable for all industrial sectors, including medical applications. 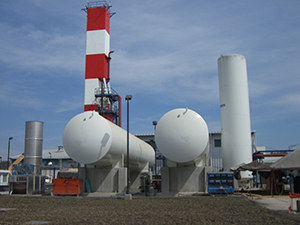 Cosmodyne’s nearly 50 years of experience w ith cryogenic plants is reflected in the design and durability of the POPLAR series. 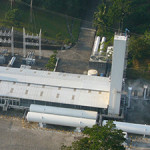 Capacities range from just over 40 metric tons per day to 200 tons per day of total liquid product. 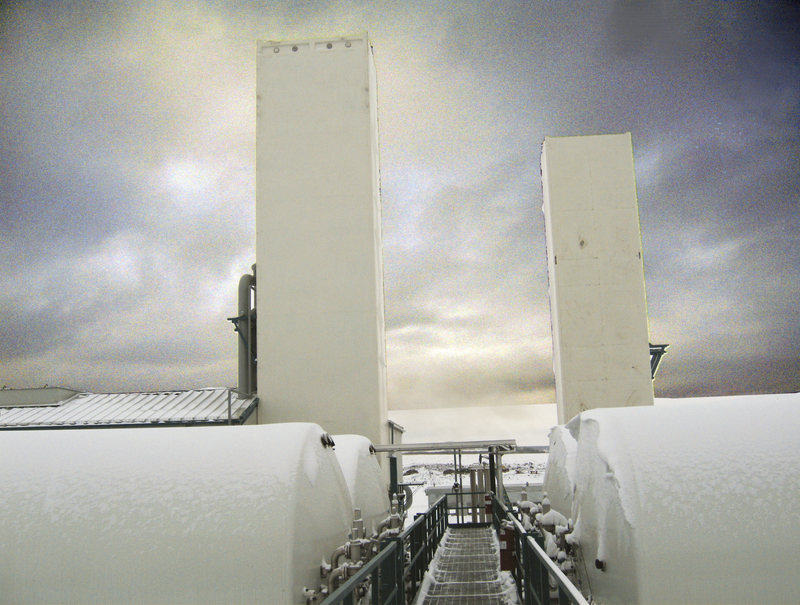 The plants have been designed to provide the lowest specific power, as low as 0.89 kw-hr/Nm³. 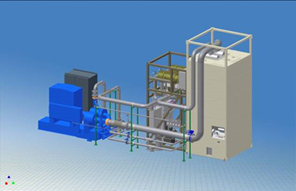 The POPLAR plant is designed to minimize shipping and allow for rapid installation by providing the plant in seven distinct, pre-piped and pre-wired modules: cold box, turbo-expander, air chiller, heater skid and adsorber vessels. 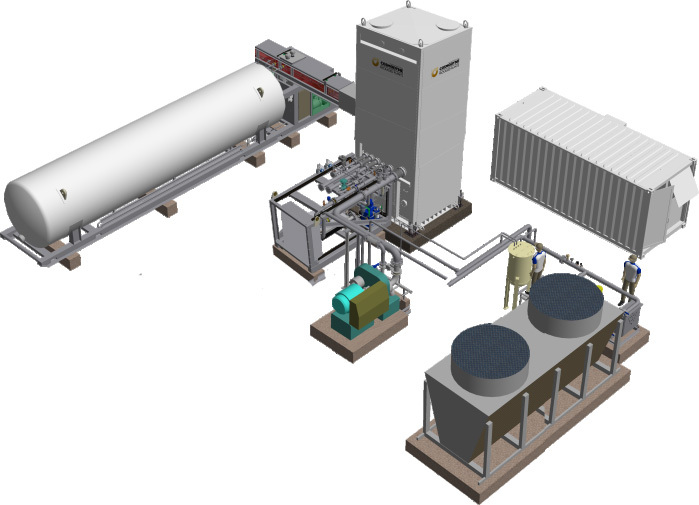 The POPLAR air separation plant is a highly modular system that can produce liquid oxygen, liquid nitrogen and, as an option, liquid argon. 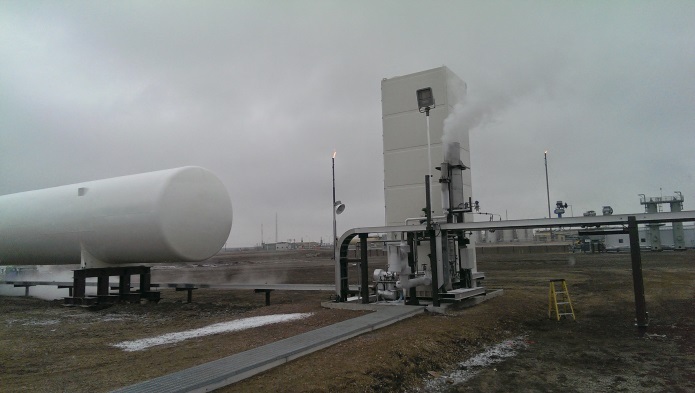 In addition, gaseous nitrogen or gaseous oxygen is also available if required for on-site or pipeline applications. 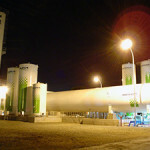 The POPLAR plant employs a PLC based control system, with a user-friendly graphic interface. 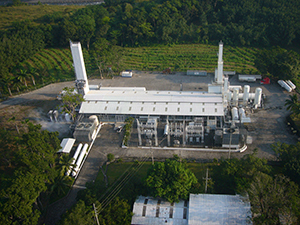 After start up, the plant operation is fully automated with provision for local or remote access via telephone line or the internet. 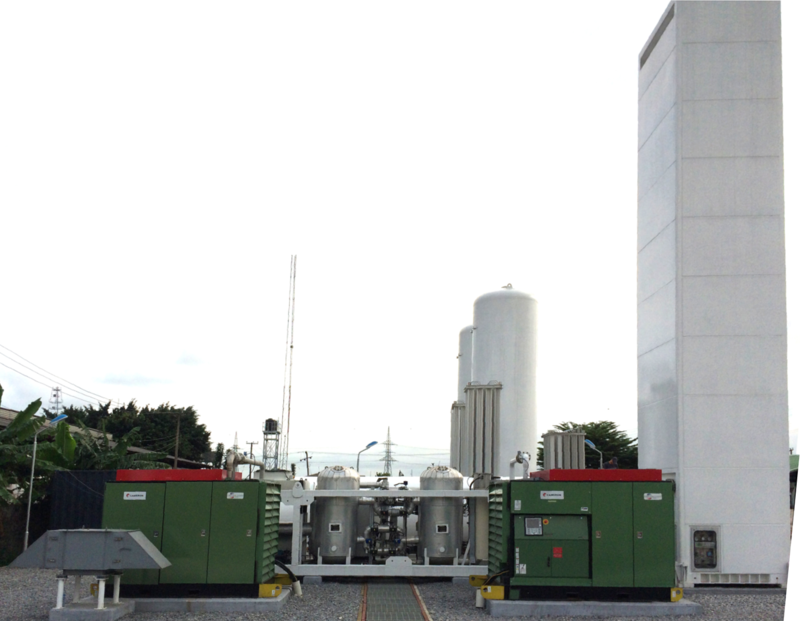 The battery limits to the plant are simple; power to each of the two compressors, power to the medium voltage distribution, cooling water, and product connections. 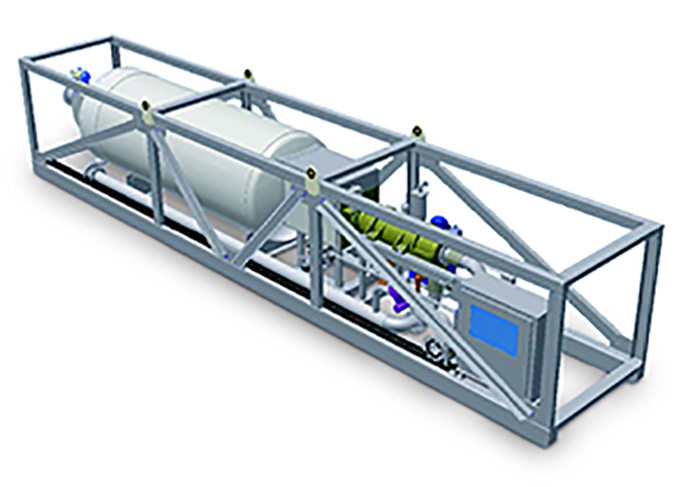 When run in maximum oxygen mode, a nitrogen gas stream is available for pipeline application or future liquefaction. 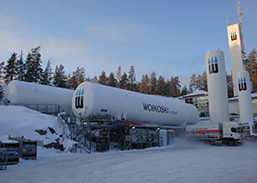 Similarly, in maximum nitrogen mode, the plant can be tailored to produce oxygen gas along with other liquid products for pipeline or other on-site application. 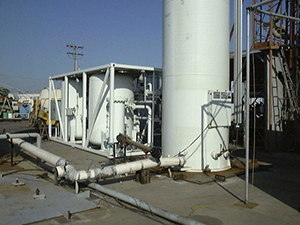 If desired, the gas streams can be fed to a Cosmodyne ELM series liquefier for liquefaction. 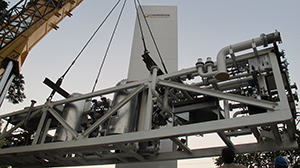 Cosmodyne is a world leader in the design and manufacture of air separation plants. Each Cosmodyne system is designed and built to rigorous standards of quality and workmanship from nearly a half-century of experience. 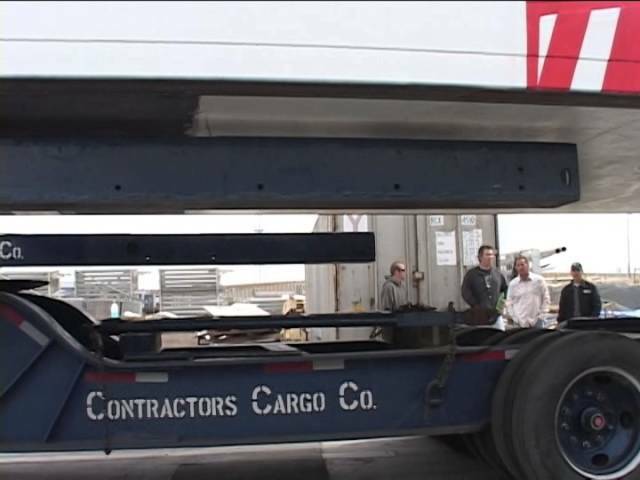 From proposal to installation, our sales, engineering, manufacturing and field-service personnel continually demonstrate our commitment to customer satisfaction. And this commitment doesn’t end with delivery — our field-service staff is ready to serve you 24 hours a day, wherever you are. 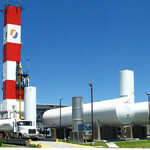 When you buy a Cosmodyne plant you can be sure you will receive a quality built and reliable plant. 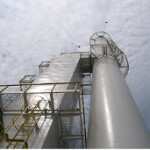 All plants, regardless of destination, are built to the following codes: – Pressure vessels: Per ASME Section VII, Div. 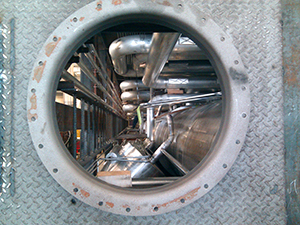 1 and includes code stamp and name plate – Piping systems: Per ASME B31.3 – Electricals: NEC, NEMA and UL standards Additional code compliance available including: CE/PED, CRN/CSA, GOST, MIL-SPEC, API and various marine certifications. Prior to shipping, each module is tested for pressure, strength, tightness, and control functionality. 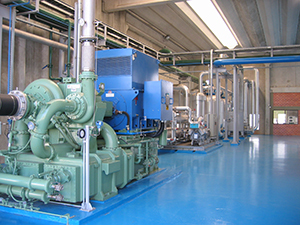 Specific power excludes cooling water power.